Not a new chart-topping band, bacterial nanowires are tiny connections produced between microbes to transfer electrons, and the corresponding journal article was again named a hot paper by ISI's Essential Science Indicators. Every 2 months, ISI lists the "hot papers in science." These papers are selected because of their phenomenal rise in the scientific literature, as the articles are repeatedly cited within just 2 years of publication. 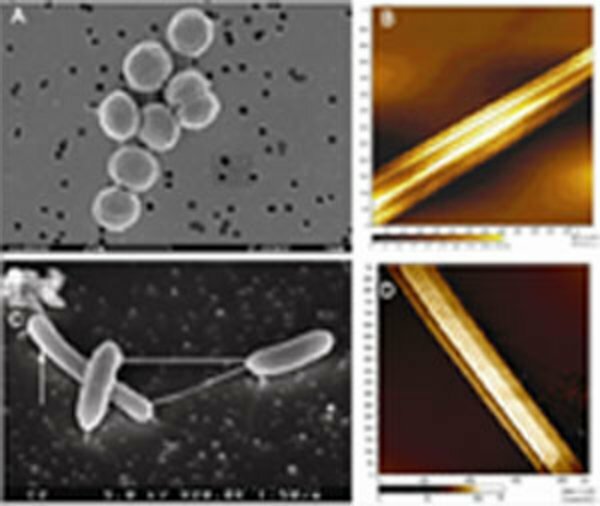 On the March 2008 list, the article "Electrically conductive bacterial nanowires produced by Shewanella oneidensis strain MR-1 and other microorganisms" appears as a hot paper. The article has been cited 57 times since it was published July 25, 2006. To detect the nanowires, researchers used several instruments available at the Department of Energy's Environmental Molecular Sciences Laboratory, a national scientific user facility. These instruments included scanning and transmission electron microscopes, tunneling spectroscopy, and fluorescence microscopy. This article was written by 24 scientists from the Pacific Northwest National Laboratory, University of Guelph in Canada, Gwangiu Institute of Science and Technology in Korea, Water Environment and Remediation Research Center in Korea, Pennsylvania State University, and the University of Southern California. At PNNL, the authors were Yuri Gorby (now at the Venter Institute), Svetlana Yanina, Jeff McLean (now at the Venter Institute), Kevin Rosso, Alice Dohnalkova, David Culley, Bree Reed, Margie Romine, Eric Hill, Liang Shi, Dwane Elias (also of the University of Missouri), David Kennedy, Grigoriy Pinchuk, and Jim Fredrickson. Citation: Gorby YA, S Yanina, JS McLean, KM Rosso, DM Moyles, A Dohnalkova, TJ Beveridge, IS Chang, BH Kim, KS Kim, DE Culley, SB Reed, MF Romine, DA Saffarini, EA Hill, L Shi, DA Elias, DW Kennedy, GE Pinchuk, K Watanabe, S Ishii, B Logan, KH Nealson, and JK Fredrickson. 2006. "Electrically conductive bacterial nanowires produced by Shewanella oneidensis strain MR-1 and other microorganisms." Proceedings of the National Academy of Sciences of the United States of America 103(30):11358-11363.